Nick has a happy life in Happy Valley, NJ. He likes his school, his modern house with a front and back yard, and suburban life in general. His parents, however, felt that the suburbs were a poor environment for a young boy to grow up in…so they move to Hoboken. Unsure of the logic of the move, Nick (whose real name is Ivan Itch) has the opportunity to experience the “urban lifestyle,” and he does from the first day-his bike is stolen. Although it is a used little girl’s bike with pink hearts all over it, he wants it back (“It’s the principle of the thing,” he tells Officer Spooney.). In the meantime, he becomes friends with Loretta Fischetti and Bruno Ugg. Together, they spend the hot summer days reading Classic Comic books, listening to WRJR, (Hoboken’s pirate radio station run by Vic Trola), and trying to catch bats with their hats at the city park. However, all is not well. Nick’s bike isn’t the only item stolen. Other bikes in Hoboken have disappeared as well. The thefts are blamed on a mysterious person, a phantom who leaves broken machinery and half a tuna fish sandwich at the crime scene. The final straw comes when the kid’s collection of Classic Comics are swiped. “Now it’s personal,” Loretta Fischetti said. “It wasn’t personal when my bike was stolen?” [Nick] asked. “Now it’s more personal,” Loretta Fischetti said. As they begin to dig into the mystery of the phantom, they encounter many odd people who “dummy up” when it comes to giving information. Discovering a scrapbook, and the town librarian Starr Lackawanna, Nick, Loretta, and Bruno begin to piece together the clues that not only solve the phantom mystery, but also resurfaces an unspeakable event in Hoboken history that involves a mad scientist, a boy named Bobowicz, and a six-foot rampaging chicken (“Her name is Henrietta. She likes potatoes. Be nice to her.”). How do all of these random things relate into one story? 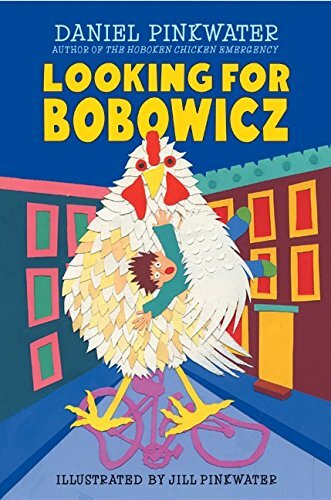 You’ll have to read Looking for Bobowicz and find out for yourselves. I’m afraid I can’t say any more, I’m D and D (“Deaf and Dumb”).